Ketone esters for the treatment of seizures in AS – clinical trial coming soon! 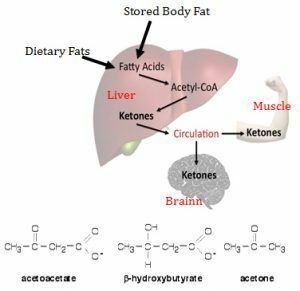 Ketones are natural compounds made by our body when we are burning fat during caloric restriction, starvation, or when eating a low carbohydrate (CHO) diet. Ketones can replace glucose (sugar) as a source of fuel for energy in the body. This strategy is particularly effective in the brain, enhancing brain energy reserves when used as the primary source of fuel. Ketones can improve signaling throughout the brain and protect the brain as an anti-oxidant and anti-inflammatory. In addition, ketones can enhance motor performance based on improved brain function. There is evidence from patients with epilepsy that implementation of a ketogenic diet (or low glycemic index diet-LGIT) can help prevent epileptic seizures, and potentially improve learning and cognition. In 2006, Valente et al. published a study that tracked 4 children with Angelman Syndrome (AS) that were using the ketogenic diet. There was a positive effect with reduced seizure activity or need for anti-epileptic drugs, when the children were given this low carbohydrate diet. When the body does not have sugar/glucose/carbohydrates, it must find an alternative source of energy. When carbohydrate stores are used up, the body uses fat for energy. The byproduct of fat breakdown is ketone bodies (e.g beta-hydroxybutyrate, acetoacetate, and acetone=BOHB, AceAc, Acetone). These ketone bodies are then metabolized and used for energy. An oral supplement like KES, which are essentially the ketone bodies mentioned above, is very caloric and energy dense. A recent study in AS mice at the University of South Florida (Poff, et al.) found that ketone supplementation, without CHO restriction, improved motor function, balance, learning, memory, and seizures in the AS mouse model. The KES were found to delay the onset, reduce the number of seizures by 50%, and increase the seizure threshold in the AS mice. It is thought that the elevated levels of acetoacetic acid and acetone ketone bodies possess an intrinsic anti-seizure property. This is likely due to an increased GABA:glutamate ratio in the brain, resulting in more “tonic inhibition.” These KES also improve metabolic efficiency, enhance motor function and enhance mitochondrial health, which are disrupted in AS. Disruptive Nutrition is developing a medical food which is considered a ketone booster. This oral ketone supplement is a large source of calories, and will result in a dose dependent elevation in blood and brain ketones without the need for strict dietary restrictions like that seen with the LGIT diet. It is expected to have a rapid and sustained ketone elevation in the 3 major ketone bodies (BOHB, AcAc, Acetone). This should provide the benefits of ketones in the brain without dietary restrictions. This oral ketone supplement is considered a medical food. A medical food is one that is formulated to be consumed or administered by mouth (enterally) under the supervision of a physician, and which is intended for specific dietary management of a disease or condition. It will likely be available in various formulations: gel cap; powder; and liquid. A clinical trial will be starting with the first clinical site at the USF. The timeline for this is expected within the next 12 months. What is the risk of ketoacidosis? Ketoacidosis results in acidification of the blood and tenfold higher levels of ketones compared to therapeutic ketosis. How does this compare to Raspberry Ketones? This is not at all related, “ketone” is a generic chemistry term. Is this available over the counter? No, this is a totally new technology. Were mice monitored for cholesterol, weight gain, blood lipids, etc? They were monitored for weight gain, blood lipids, and cholesterol and there were no significant changes. Were the mice eating a LGIT diet or a standard CHO diet? They were eating a standard rodent diet with KES added thus adding additional fats and altering the macronutrient profile. Only 10% of the diet coming from the supplement was as a new fat. In the clinical trial will participants be on normal diet? Our goal is for this to benefit as additive to a normal diet, but the reality is that there might still need for carbohydrate restriction. What doctor should monitor patients on this supplement? Ideally, a neurologist and nutritionist will work together as ketosis requires monitoring of blood and urine to avoid things like acidosis, high cholesterol, or abnormal lipid profiles. How quickly does this get into the blood to change blood levels? 30 minutes.